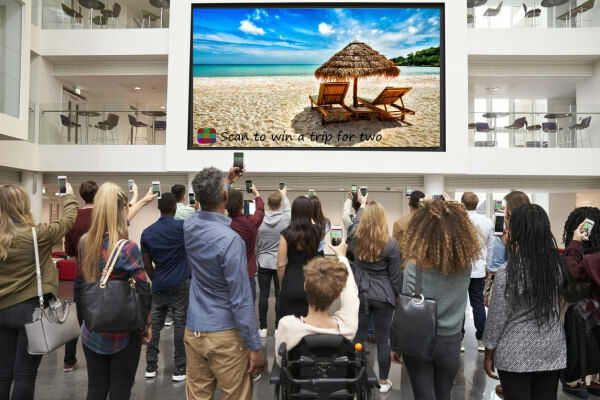 The conversation around omnichannel marketing often focuses on how brands can bring web and mobile campaigns into harmony with the more traditional channels of print and television, but how does out-of-home (OOH) advertising fit into the equation? It’s something marketers must figure out, as OOH is one of the last traditional advertising areas that’s still growing. TV, by comparison, is in shrinkage mode, and brands are investing way more in OOH ads that factor into their omnichannel campaigns. Bus or subway station signs and highway billboards face a whole different set of challenges and opportunities than print, TV, mobile and web. One of these challenges is how to get audiences to interact with the content. Getting them to see it isn’t a problem: people spend three hours of their day in the presence of an OOH ad, either static or digital. Getting them to act on it, however, can be next to impossible. Brands are working hard and investing big dollars to create an immersive experience that surprises and delights passersby. By doing so, they create buzz in consumers’ conversations and social feeds, thus growing their reach exponentially. This approach is a good start, for brands that get it right, but it still lacks one thing: It doesn’t hold the door open for consumers to take immediate action. A technology such as a scan code creates just such an opportunity for viewers of the ad to make an immediate purchase. All they’d have to do is go into the brand’s app and scan the code for a quick, easy, and completely spontaneous purchase experience. A scan code doesn’t have to lead straight to a transaction, it can be used to give the user more information, schedule a test drive, provide incentives and so much more. Sodyo has introduced a solution that utilizes a colored matrix scan code, called a Sodyo Marker, which enables people to simply point their device’s camera at the code to interact, in a similar manner as one would scan a QR code, however, the Sodyo Marker can easily be scanned from afar, meaning customers can jump into the experience even if they are just rolling by in the bus or are a passenger in a carpool or just on the other side of the street. The marker takes up very little space on the ad and scans much faster than a QR code, which provides a better user experience. The ease of use and similarity to an existing, understood technology helps lower the barrier to entry so that audiences can get straight to the content they want without having to learn a new technology. But that’s not all, the biggest revolution in using Sodyo is that it can be used on all forms of advertising - a billboard, a bus stop poster, TV, etc. It’s the only technology that can work on print and digital, indoors and out. In fact, why not use all of the above? Another benefit to leveraging a scan code is that it can tie an omnichannel campaign together. That way, whether consumers encounter an ad outside of the home – say, during their commute – or at home – say, on TV after work – they are all being channeled in the same direction, each via his or her own unique path of least resistance. Thus, a small colored square could become the key to true anytime, anyplace advertising that meets consumers wherever they are, and it’s a small, easy add for brands that have invested in their ads and mobile user base. They’ve got financial skin in the marketing game, so why not get the most out of their campaigns by making it as easy as possible for the customer to do business with them? For brands that have yet to build up that user base, a scan code could become a means of onboarding new customers. Imagine that a fast food chain wants to encourage downloads of its mobile app, or encourage people who have already downloaded it to log in and use it more often. Offering an incentive such as free dessert with any order or a “buy one, get one free” deal could help motivate customers to make a commitment move by downloading or using their app. Wherever your brand falls on the spectrum, drop us a line to find out how a scan code could grow your traffic and business.